Ashwagandha/Bala Oil, organic, 4 oz. This massage oil is vata pacifying and can be used to strengthen muscles and nourish tissue. It is suitable for athletes as well as elderly persons and those convalescing after major illness. Bala, in particular, is used to restore muscles that have been atrophied by illness or malnutrition. Ingredients: Sesame oil*, Ashwagandha root (Withania somnifera)*, Bala root (Sida cordifolia)*. Ingredients: Arjuna, Manjistha, Hawthorn Berry, Amla, Bibhitaki, Haritaki, Licorice, Holy Basil, Fennel, Honey, Organic Alcohol, Vegetable Glycerin, Distilled Water and essential oils of Peppermint, Fennel, Cinnamon, Myrrh, Tulsi, and Clove Buds. HealThy Skin, 90 tablets, 500 mg. HealThy Skin formula blends nine of the most powerful Ayurvedic herbs for skin health, creating a formula that supports healthy skin from within. Clear, radiant skin requires proper nutrition, hydration, and oleation. Toxins, excess heat, and inadequate nourishment can all contribute to skin issues. The cleansing herbs in Healthy Skin support the body"s natural ability to remove toxins from the blood, lymph and liver. Simultaneously, pitta-soothing herbs help relieve excess heat and calm irritable skin. The nourishing herbs in this formula also promote rejuvenation of the skin cells and support the skin"s natural healing process. The skin is a mirror for how things are inside the body. The cleansing and rejuvenating herbs of Healthy Skin beautify the inside to give you vibrant, glowing skin on the outside. Ingredients: Anantamul root (Hemidesmus indicus), Manjista root (Rubia cordifola), Neem leaf (Azadirachta indica), Turmeric root (Curcuma longa), Brahmi/Gotu kola leaf (Centella asiatica), Guduchi stem (Tinospora cordifolia), Bhumyamalaki herb (Phyllanthus amarus), Amalaki fruit (Emblica officinalis), Licorice root (Glycyrrhiza glabra). Other ingredients, from natural sources: organic maltodextrin, silicon dioxide. Free of gluten, soy and dairy. 100% vegetarian. 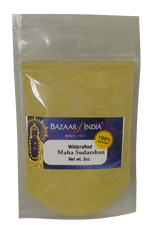 Maha Sudarshan Powder, 2 oz. Mahasudarshan is a very complex Ayurvedic formula that enhances the functioning of the immune system by subtly cleansing the body of toxins. It reduces kapha and pitta and very slightly increases vata. 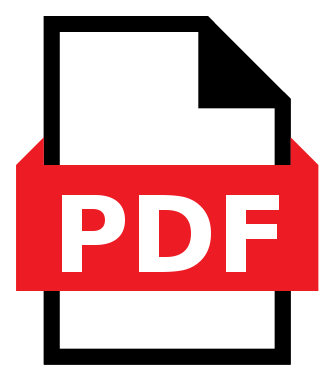 It is especially valuable when there is a persistent, chronic infection. It is hepatoprotective and has traditionally been used when there are epidemics such as malaria or typhoid. Ingredients: Amla (Emblica Officinalis), Haritaki (Terminalia Chebula), Bahera (Terminalia Bellerica), Turmeric (Curcuma Longa) Rhizome, Haridra (Berberis Aristata), Brahati (Solanum Jacquini), Kantkari (Solanum Xanthocarpum), Kachur (Curcuma Zedoaria), Ginger (Zingiber Officinale), Pepper (Piper Nigrum), Piplamool (Piper Longum), Murva (Maerua Arenaria), Giloy (Tinospora Cordifolia), Jivanti (Leptadenia Reticulata), Kutki (Picrorhiza Kurroa), Pitpapra (Fumaria Officinalis), Nagar Mothan (Cyperus Rotundus), Neem (Azadirachta Indica), Pushkar (Inula Racemosa), Licorice (Glycyrrhiza Glabra), Kutaja (Holarrhena Antidysenterica), Ajwain (Carum Couticum), Kamala (Kamala Mallotus Philippinensis), Kakoli (Piper Cubeba), Bharangi (Clerodendron Serratum), Sohanjna (Moringa Oleifera), Saphatakari Purified Alum Powder, Cinnamon Bark Powder, Khas (Andropogon Muricatus), Sandal Wood, Shalparni (Desmodium Gangeticum), Prishparni (Uraria Picta), Vavding (Embelia Ribes), Tagar (Valeriana Wallichii), Chitrak (Plumbago Zeylanica), Devdaru (Cedrus Deodara), Chavya (Piper Chaba), Patala (Stereospermum Suaveolens), Kalmegh (Andrographis Paniculata), Karanj (Pongamia Glabra), Clove (Myrtus Caryophyllus), Vanshlochan (Bamboo) (Bambusa Arundinacea), Tej Patta (Cinnamomum Tamala), Nutmeg (Myristica Fragrans). 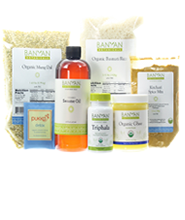 Ingredients: organic Rama Tulsi, Ocimum sanctum, aerial parts, organic Gotu Kola, Centella asiatica aerial parts, organic Lemongrass, Cymbopogon citratus aerial parts, and organic Ginger, Zingiber officinalis rhizome.